Rumors of a single-stack 9mm Glock has been floating around and now it is somewhat official. 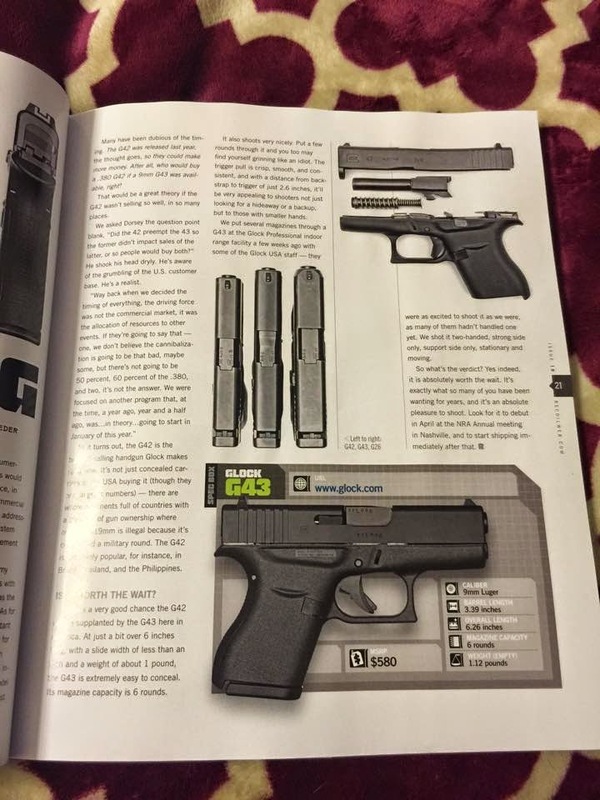 Glock 43 is the single-stack 9mm that seems to be made in similar length as the G26. According to the photo of (RECOIL) magazine it has capacity of 6 rounds and MSRP of $580. Price will probably come down to high $400s after initial rush is over, but it is a bit higher than its competitors. After years of delay Glock is finally getting out the pistol its fans want, but the question is whether it will significantly capture the market. In last 5-6 years demand for CCW pistol has grown and Ruger(LCP), S&W(M&P Shield) and Springfield Armory(XD-s) has been quick to respond to change in demand. Glock's first move was to release G42 chambered in .380 acp and slightly over 1 year later release G43. Some have suspected that this was all part of Glocks strategy to maximize gun sales. If G43 was sold before G42 it wouldn't help with sale of G42. Whatever the reason is, the delay doesn't seem to favor Glock in the long term. By delaying development of G43, Glock lost chance to take a strong foothold of the market. There is some merit to counter argument that Glock can still capture some market share due to its (supposed) better quality, but it will not be as easy as a few years ago when there were less competitions. It is certainly great to see more choices on the market as a consumer, but it certainly raises question about Glock's decision being the best one or not.